Instructor of Erosion Control and Watershed Restoration at Shasta College, Redding Ca. John McCullah has an AA degree in Biology and a BS in Watershed Geology. He has CA contractors license since 1990 and has been performing erosion control and restoration work for over 25 years. 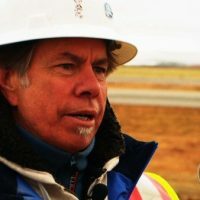 He has designed and built many environmentally sensitive river and stream projects of the last years from California to Alaska, Alberta Canada to New Zealand. While heavily invested in teaching, training and coaching others, John is always interested in contract work or consulting services. If you have a project you need help with, please reach out here with your name, contact email and a brief description of the project. John has been a Certified Community College Instructor since 1996, developing curriculum and teaching at Shasta College in Northern California. He is a recognized expert in erosion control, stream and watershed restoration, and technical training. He has had specialized adult educator training while teaching state-wide storm water courses for California Department of Transportation for ten years. He is also certified as a QSD and QSP (Qualified SWPPP Developer and Practitioner) and he is a Trainer of Record for these CA professional requirements. As an academic and practitioner with dozens of case studies and Dirt Time clips, John’s trainings are filled with first hand, practical experiences. View options to learn from online courses or attend workshops and get hands on experience. John has authored 3 complete Best Management Practice Manuals and helped develop new BMPs with California Department of Transportation Division of Landscape Architecture, particularly Steep and Adverse Slopes. He has been teaching professional development courses for IECA since 1996. Additionally, there are now over 15 Dirt Time episodes and 50 video clips available as educational resources along with his recently co-authored book; Bioengineering Case Studies – Sustainable Stream Bank and Slope Stabilization published in 2014 by Springer. Check out the Educational products for purchase and start learning today.